I have just listened to a video and it has resonated in so many ways! The speaker, Dr Brené Brown, is talking about many things, but mainly about vulnerability. Recently I have come to realise that I need to be more open and stop shutting down my emotions. Now I know some people will laugh when they hear that because I am such an emotional person, but I have just now realised the difference between a couple of years ago and now. Once, and particularly after John died, I locked my emotions up so tightly because I was afraid that once I started to feel (pain), I wouldn’t be able to stop. I became an expert at putting on a ‘good face’ and appearing that all was going reasonably well. The problem was, I had such a tight hold on my emotions that every now and then they burst through those bonds, and I had, what amounts to, a mini breakdown. During this time, it was like I had no control, and my emotions would run from high to low and back again several times a day or even in an hour, until I was mentally and physically exhausted and then I would sleep and wake up once again with a firm grip on how I felt – or thought I felt. Over the last few years, as I have been learning more about myself I have realised that I need to show who I am. I have spent far too many years trying to be what I thought other people expected me to be, but now I have come to realise that I can be who I (underlined) want to be. This hasn’t been easy, and I have lost a few friends because I no longer will allow myself to be the follower, the one who does what everyone else wants and is too afraid to say anything in case people don’t like me. I have learned that I am enough as I am and if other people can’t accept that, then there is not a place for them in my life. In effect this has meant showing my vulnerability, and for me – particularly in my writing. I have come to realise that being vulnerable is not a bad thing, but it is not necessarily a good thing either. It just is. Unless we are willing to be real and open ourselves up to show who we really are, what is the point? We are who we are, and if that’s not good enough for others, then move on and find people who do think it is. One of the things that really struck me in this talk was ‘You cannot selectively numb emotion.’ We use all kinds of things to numb emotion, such as food or drugs or alcohol, but if we use these to numb the bad feelings such as fear, grief, shame or disappointment, we also inadvertently numb the good things such as joy, happiness and gratitude. I know, for me, that all my life I have used food to numb shame and fear, among other emotions, and it wasn’t until I really started to change my whole life, including my diet and my thought processes that I understood that this same ‘solution’ was also making me even more unhappy. Sometimes when I am writing these blogs and other stuff, I wonder why I feel the need to be so open and therefore vulnerable, and wish that I could write stuff that is not so full of my emotions and thoughts. Believe me, I have tried, but like life, what is the point in showing and being something you are not. This is how I process stuff, how I move forward and hopefully by me putting my thoughts out there, someone else will have an ‘ah-ha’ moment and begin to understand themselves just a little more. 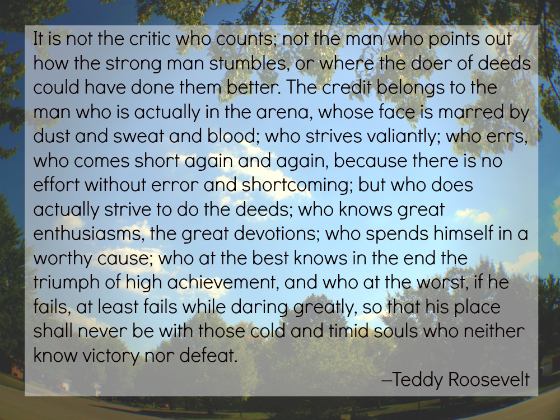 Dr Brown uses a quote by Theodore Roosevelt and as I read it I thought how true it is. We all fail, but it is often that fear of failing that stops us trying anything new, and that is sad. We will fail at some things, but we will succeed at others and that makes all the failures worthwhile because it has bought us to a place that we might not have seen without those bumps in the road. I am going to print this out and have it where I see it and at the beginning of each day I will remind myself to ‘dare greatly’ because there is so much to see and do in this world and I am tired of hiding behind the fear!